If you’ve ever dreamed of starting your own home-based handyman business but have been hesitant to put your business plans into action, this book is for you. 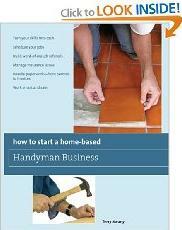 It contains all the necessary tools and success strategies you need to launch and grow your handyman business. Homeowners come in all shapes and sizes, and differing degrees of fix-it abilities. But one thing’s for sure: The more money someone earns, the less economical it is for them to tie up time cleaning gutters, replacing light switches, or tend to a thousand other repair and maintenance issues large, small, and everywhere in between. That’s where you, the handyman, come in. If you’ve ever dreamed of starting your own home-based handyman business but have been hesitant to put your business plans into action, this book is for you. It contains all the necessary tools and success strategies you need to launch and grow your business. Veteran handyman, contractor, and author Terry Meany shares his experiences and advice on every aspect of the trade. Learn how to develop a business plan, estimate your start-up costs, price your services, and stay profitable once you’re in business. Read all about getting clients and referrals, outshining the competition, bidding competitively, establishing your daily schedule, organizing your business, getting paid, and much more. • What Can You Offer that's Unique?